The Department of Human Services called me today and investigated. 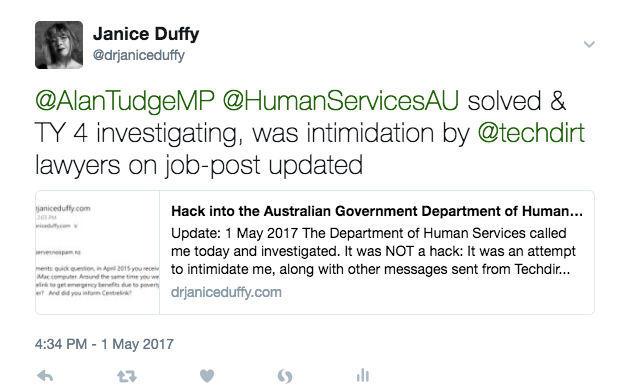 It was NOT a hack: It was an attempt to intimidate me, along with other messages sent from Techdirt.com devotees. It worked! 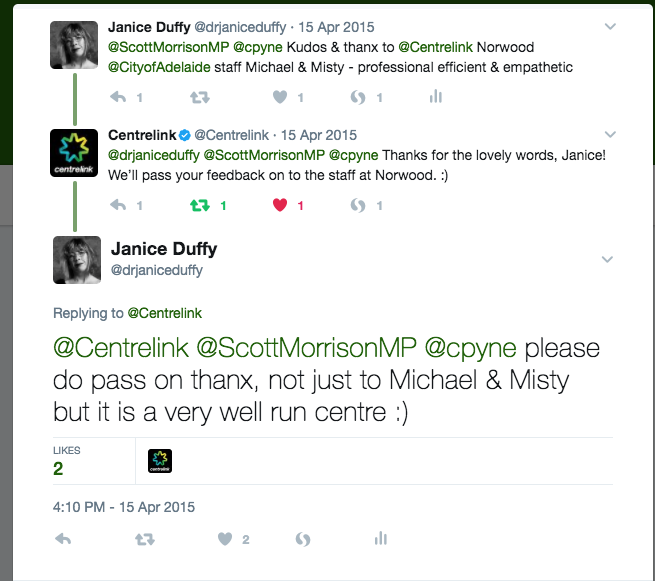 The government investigator identified two of my tweets thanking people that, taken together, could been used by this person (whom I believe to be an Australian living in Sydney) to try and spook me. 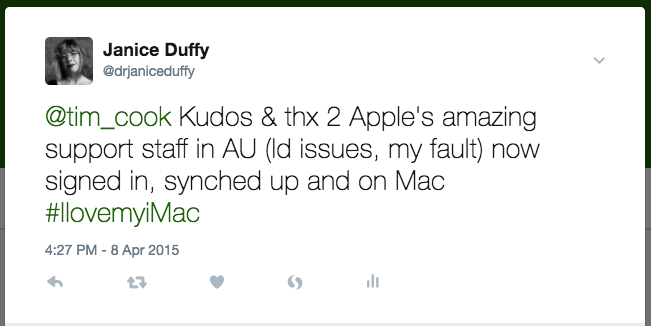 On 8 April 2015 I tweeted my thanks to the Apple (CEO) for the wonderfull support they provided because I had forgotten or lost my Apple ID. It seems that someone was trying to scare me. This appears to be associated with Techdirt. I was gifted an iMac computer from a friend and a supporter because my PC was dying. I was extremely gratefull and I love it, but it was not an ‘expensive’ Mac. It was base level and that fitted my needs perfectly. I have the documentation. I applied for, and receive a carers pension from the Australian Government because I am the sole carer of my frail aged father. For five years I supported myself and my parents and fought Google by living on my savings. 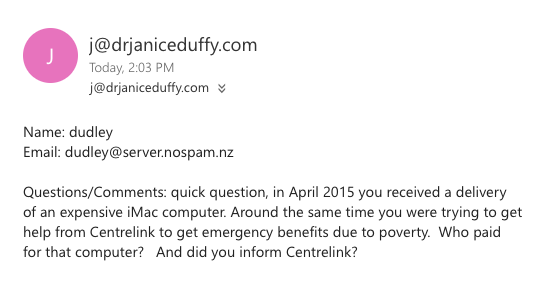 I provided all correct documentation to Centrelink when I applied for the carers pension. My circumstances were, and are well within the rules. I have not hidden anything from the government. It appears that Techdirt has succeeded in scaring me. But clearly that was their intention to combine threats of physical harm and psychological abuse with intimidation. Really? you think Techdirt (in as far as the people who actually write for it) care about humiliating you? they are writing about the stupidity and egocentric nature of your case. As for the rest of your comment the phrase “lol wut” comes to mind. I wish you luck in your next lobbying endevours, though don’t expect it to be as easy sailing as you think. At this point, all I can say is thank you to Alan Tudge MP, Minister for Social Services for acting so expediently on this matter. I have received another abusive email. I believe it is associated with Techdirt. I am meeting with lawyers this week. This has to stop! There is NO recourse for Australians harassed online other than years of litigation if the Tech companies refuse to honour police warrants. In the meantime, I have tweeted my thanks to the Department of Human Services. Especially, thank you Darren for a job well done :). I do appreciate your calm and professional manner in such a difficult situation. So which Techdirt ‘Insider’ is trying to intimidate me? Well clearly he is an Australian. Seriously, what sort of person tries to use two tweets in which I offered my sincere thanks to support staff (who usually have to field abuse and customer complaints as an integral aspect of their job) into a weapon of intimidation? I guess we will see!